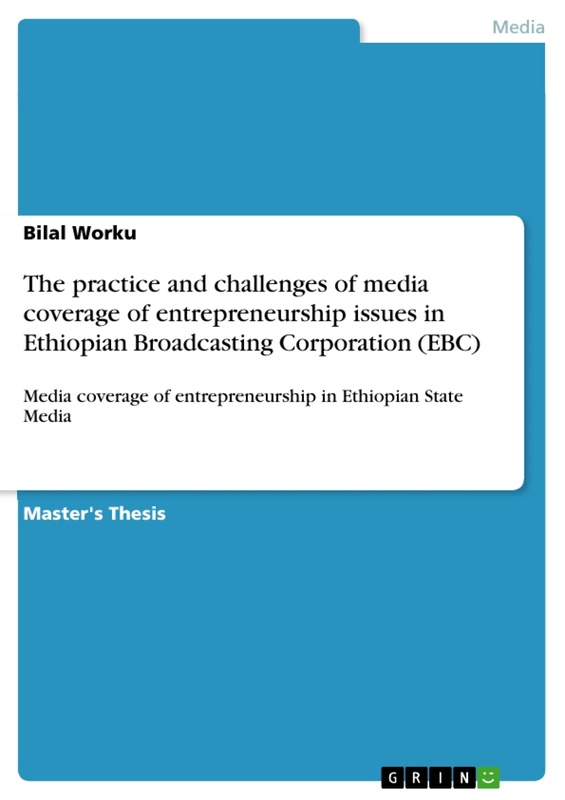 This research attempted to examine the practice and challenges of media coverage of entrepreneurship issues in Ethiopian Broadcasting Corporation (EBC). Specifically, the study evaluated the extent of the coverage and prominence being offered to entrepreneurship news, the source of entrepreneurship news, the way of presentation of massages in the stories (frame) and challenges of reporting on entrepreneurship news. The study was formed by development communication, social responsibility and framing theoretical frameworks. The study employed mainly quantitative method and supplemented by qualitative one. A content analysis was conducted on the stories carried by the corporation to provide a brief description on the extent of the coverage, frames and source of entrepreneurship news. In addition, an in-depth interview with 12 key informants was used as supplementary tool to support the quantitative findings and to find out challenges of reporting on the issue. Analysis of data was made by SPSS using descriptive, graphs, charts, and tables. The study revealed that EBC did not give necessary and adequacy attention to the coverage of entrepreneurship issue. It also showed that the amount of coverage and the degree of prominence given to the issue were very low and not strong enough. Government officials influence the journalist’s news frame and they have better chance of getting the voice rather than entrepreneurs. Most of entrepreneurship news stories are event based and sourced by the government organizations. In general, the coverage is favors what the government is doing on entrepreneurs and entrepreneurship development rather than what the entrepreneurs are doing. Internally trends of collecting money among reporters and media as an institution to give fine coverage of news in favor of the payer and lack of understanding on the issue and externally the government influence are the major challenges of reporting on the issue. The findings of the study imply EBC fails to create awareness, inspire and mobilize the society at large on the power and value of entrepreneurship development. Based on the findings, pertinent recommendations were forwarded. First of all, I would like to express my earnest gratitude to my adviser Dr. Zenebe Beyene for his invaluable comments, essential guidance, warmth welcome and sincerity in sharing his professional experience and encouragement he provided me throughout the study period. I am grateful to Dr. Mohammed Jemal whose moral and technical support was my true effectiveness. My special thanks also go to Alias Aman (the editor of this paper), Sileshi Demsew, Bereket Shimelis and Abayneh Tilahun (my friends and classmates) for their whole hearted friendly support during the two years of my study. My deepest gratitude also goes to my wife Saada Negash and my little daughter Aamira Bint Bilal you are always the source of my strength. Throughout human history, entrepreneurs have seized the initiative to change the economic landscape. The olden-day hunters, gatherers, farmers, tool makers can be said to be the earliest examples of entrepreneurs (Bhole, 2007). Known in our age, the major sources of wealth and development for a human being are land, manpower, capital and entrepreneurship (Weretaw, 2005). Therefore Entrepreneurship is one of the crucial elements of economic growth for many cities and countries around the world. Entrepreneurship is also seen as a major drive in achieving social and economic development by which, consequently, poverty alleviation will be realized. It is widely acknowledged that entrepreneurship is an important input in both individual and national development processes. Entrepreneurs create value for both themselves and the organizations that they have created or are employed in (Mudde, Dugasa, & Alemfrie, 2015). One of Ethiopia’s exemplar Entrepreneur Bethlehem Tilahun Alemu was born and raised in Ethiopia, Addis Ababa, Zenebework area, which is a small, impoverished part of the city. In her childhood days, she discovered that people of her community were living in abject squalor for there were very few jobs available. 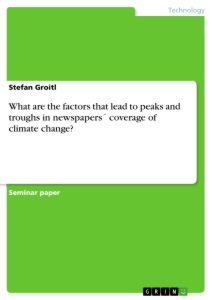 The researcher of this paper who is a journalist by career also lives in this area and gets the chance to engage in some observations on the locals. Even though most of the residents were unemployed, owing to my profession, I had an opportunity to interview her, and she told me that she discovered several of them possessed remarkable and untapped artisan skills. This observation drove her to brainstorm on ways through which she could transform the skills of her community members to a sustainable enterprise. She thought this could generate livelihoods for them, and create wealth in the long run. It was this very conception that was born in her mind finally enabled her to become the owner of sole rebels, which is one of the most successful and worth mentioning domestic footwear producing companies in Africa. Though I highlighted Bethlehem for her best-applauded recognition as a woman and indigenous entrepreneur before the world, Ethiopia has other many similar entrepreneurs that can be exemplified for their remarkable achievement in running and developing a business that emerged from the local skill and resources and grew to a large scale company. However, it is also pity that most of the time we usually share their creativity, risk-taker and innovativeness, success, challenges, as well as their experiences through other, particularly in the western media CNN and BBC than the domestic one. 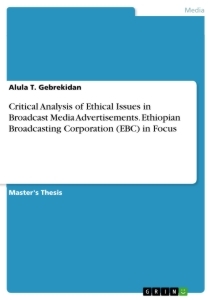 This rises researcher's inquisitive interest to examine how and to what extent the Ethiopian media particularly Ethiopian Broadcasting Corporation (EBC) treating the issue. Over the recent years, there has been a marked shift in the ways of the media engagement with the notion of entrepreneurship and enterprise. There is a need to look through to what extent the ‘coverage' is extended and how it is framed. This will in turn leads us to scrutinize the level and gap of mass communications in promoting entrepreneurship. According to Verin (1982) cited in (Fayolle, 2007), in the middle Ages, the French word ‘entrepreneur' nominated a person who performed a task. Later, it referred to a bold individual keen on taking economic risks. In the sixteenth and seventeenth centuries, the entrepreneur was an individual who engaged in speculative activities. The term did not yet refer to the manufacturer, nor to the seller or the trader, but generally to a person who had a contract with the king to undertake the construction of a public building or ensure the provision of supplies to the army. The conception of the ‘entrepreneur’ has evolved over time, just as economic activities have become more complex too. At the dawn of the industrial revolution, entrepreneurs were sorts of intermediaries; they were seldom the ‘producers’. They were characterized by their aptitude to take risks. Then they became the cornerstone of economic development with the undertakings of producing and innovating under the rapport of risk and uncertainty (Casson & Godley, 2005). However the definitions of the entrepreneur proposed through the ages vary slightly in meaning and precision, there remains a constant element in them: the entrepreneur and risk-taking are closely linked, and this from the very early time the notion was mentioned in written form by Cantillon in 1755. At the beginning of the nineteenth century, Jean B. Say (1803) associated the entrepreneur with innovation, a notion later made popular related to economic development in the Anglo-Saxon world by Schumpeter (Fayolle, 2007). Moreover, in the economic literature, the entrepreneur is presented with multiple facets and combines the roles of private sector, innovator, opportunist, and even coordinator and organizer of resources. Entrepreneurship has a great role in the world economic growth. For instance, Adam Smith in 1776 explained entrepreneurship as a goal to understand the wealth creation process, beginning his treatise with the lesson that the division of labor is limited by the extent of the market. As markets grew, entrepreneurship would lead to an increasing division of labor and increased productivity (Holcombe, 1998). In recent years a strong belief that admits entrepreneurship as a crucial driver of economic growth for both developed and developing nations has prevailed among scholars and policy makers (ibid). According to Ács and Virgill (2009), given the poor experience with import substitution and export promotion, countries have begun to examine the role of entrepreneurship in development. The empirical evidence is also strong in support of a link between entrepreneurship and economic growth. Studies have found that regional differences in economic growth which are correlated to levels of entrepreneurship. The recognition of the importance of the entrepreneur and the necessity of the markets for the entrepreneur to operate has led many countries to begin to work on perfecting their markets by eliminating barriers to entrepreneurship and other market failures (Acs and Virgill, 2009, p.27). According to Nagler and Naude (2014) cited in (Mudde, Dugasa, & Alemfrie, 2015), many developing countries face the challenge of creating employment for their predominant young population. In particular in Africa, the need is high to create employment with a three percent annual growth in labor supply, or in absolute numbers, the expected 170 million new labor market entrants between 2010 and 2020. Similarly, in Ethiopia also; Unemployment or lack of entrepreneurship is one of the most challenging problems faces a country. As Hoffman (2007) explanation, the recognition that entrepreneurship and entrepreneurs are important drivers of economic growth, employment, innovation and productivity has been long understood by analysts and economic theoreticians. Indeed, it dates back centuries if one considers the work of Cantillon, the first academic to explicitly attempt to define, and describe the role of entrepreneurs. It was however not until the 1990s that the term entrepreneurship became a buzzword both in the media and in political debate. Media were full of success stories about self-made billionaires while politician tends to exaggerate their support and endeavors in encouraging them more widely. According to Filion (1997), as cited in (Fayolle, 2007), Entrepreneurship is a fragmented field of research and its multiple components are observed and analyzed by economists, sociologists, historians, psychologists, and specialists in behavioral science, education or management sciences. Since 1971, entrepreneurship and media are becoming as one part of a scientific field of research. Therefore, entrepreneurship becomes a huge communication issue and a big research field because of its role, nature, origin, and characteristic. In the 21stcentury Entrepreneurs are considered to be the change agents in the socio-economic development of any country. A couple of decades ago, it was believed that entrepreneurship was hereditary (Pathak & Singh, 2007). Entrepreneurship has emerged as an important element in the organization of economies and has long been considered a crucial mechanism of economic development (Schumpeter, 2012). Entrepreneurship is the mindset and process to create and develop economic activity around the world by blending risk-taking, creativity and/or innovation with sound management, within a new or an existing organization (Duraipandian & Devasenathipathi, 2009). Particularly, in developed economies; entrepreneurship also has the potential to be the engine of economic growth through its impact on technology and innovation and the allocation and mobilization of the factors of production (Ács & Virgill, 2009). All over the world entrepreneurship is linked to employment generation, innovation and economic growth, but entrepreneurship has been downplayed in Africa over the past 30 years. Fundamental to Africa's problem is high youth (15-35 years old) unemployment, and integrating more youths into the small business sector. Because, it can contribute to alleviating the myriad of issues associated with unemployment, underemployment and poverty (Beeka, 2011). Therefore, entrepreneurship is a light of economic activities; contribute to growth and employment creation not only in advanced but also in emerging and least developed economies. Including Ethiopia in many of developing countries, populations consist of many young people who see little prospects of gaining employment with decent wages. Promoting entrepreneurship here has become a vital policy objective of many countries and development organizations (Khan, 2014). For example in Ethiopia, where there is shortage of capital, managerial resource, and skilled labor force. Unemployment (mainly as an urban phenomenon) and underemployment continue to be serious socioeconomic problems in Ethiopia despite some improvements in recent years. With around 50 per cent of the urban men between age 15 and 30 unemployed, Ethiopia has one of the highest unemployment rates worldwide (Nayak, 2014). Therefore, the promotion of Entrepreneurship and small-scale enterprises could be an important approach to tackle the poverty and to strengthen economic growth by absorbing labor force. Based on these principles, governments and major international organizations, as part of their poverty reduction, growth and economic development programs begin to focus on improving the countries’ business and investment environments for entrepreneurship (Ács & Virgill, 2009).In this regard, the World Bank, UNIDO, UNDP and EEDC for example, each have established units in Ethiopia to promote private sector particularly entrepreneurship and to provide technical assistance in the formulation of SMEs and entrepreneurs (Achintya & Baruah, 2010). In the meantime, one can easily grasp that media will inevitably play a pivotal role, particularly in the developing world like Ethiopia. There are many government and private sector policies and programs all over the world spending money on media activities designed to influence the start-up behavior of potential entrepreneurs. Throughout the world, in a vast array of activities, mass media communications are recognized and studied as a major influential factor in a wide range of attitudes and behaviors of people. So, media communications may be expected to exercise some degree of influence upon national levels of entrepreneurship participation (Kevin & Kim, (2006). Media's impact on entrepreneurship can be very helpful to encourage the entrepreneurial spirit. There is no shortage of evidence for the role of media in influencing the public and individual conception and attitude (Hang and Weezel, 2005, p.17). Presently, it is vividly seen that mass media coverage is positively and significantly associated with the volume of people running business (Kevin & Kim, 2006). Many scholars have shown that giving proper attention to entrepreneurship in different modes of mass media is critical. More knowledge and attitude influencing themes of mass media in relation to entrepreneurship is needed in order to guide all the actors including governments who use a medium in their entrepreneurship promoting strategies (Ali, Lu, Cheng, & Chaoge, 2012). In this regard, according to EC, (2007) report, many developed countries such as; USA, UK, Sweden, Spain, Canada, Australia and Denmark have a lot of entrepreneurship news and programs to give coverage to successful entrepreneurs presenting them as role models for future entrepreneurs. Similarly in Africa, some countries particularly Nigeria and Ghana give better media coverage to the issue (Angela & Jon, 2007). However, even if many developed and developing countries are giving proper attention and media coverage for the development of entrepreneurship, the government’s of Ethiopia is recognized that, a large number of unemployment particularly youths and women, and lack of entrepreneurship culture is becoming a primary cause (next to good governance and rent seeking) for the current social, economical and political instability in Ethiopia. It also holds to be true that entrepreneurship development may have given attention by the government and other non-governmental organizations in Ethiopia. Nevertheless, the roles media play and the media coverage of entrepreneurship issue in Ethiopia seems very low and is not researched. More specifically, in the best of the researcher knowledge, though the researcher tries to access all sorts of academic and nonacademic chronicles which dealt with issues linked with media and entrepreneurship in Ethiopia or how it is covered by them, the researcher can hardly get one. Thus, this research attempts to find out the extent to which and how the entrepreneurship issues are covered in Ethiopia, focusing on the practices and challenges experienced in EBC. 1. Examine the extent of EBC’s coverage regarding entrepreneurship. 2. Identify EBC‘s sources of information/news concerning issues of entrepreneurship. 3. Identify how EBC farms entrepreneurship issues. 4. Find out factors that facilitate and/or constrain entrepreneurship issues coverage. RQ1. To what extent EBC covers entrepreneurship issues? RQ2. What sources does EBC used to obtain/gather information about entrepreneurship? RQ3. How EBC framed issues of entrepreneurship? RQ4. What factors facilitate and/or constrain entrepreneurship issues coverage in the context of EBC? The study will attempt to explore how the Ethiopia's State Media practice Entrepreneurship Issues. It is expected to benefit practitioners in the media houses. It will also in cite for additional research in the area. The study is specifically important since no previous research has done on the coverage or role of media in entrepreneurship in Ethiopia, despite the issue of self-employment and unemployment is such a burning and sensitive than ever. Hence, it is believed that the study is significant since future researchers may use this study as groundwork to further study and identify other similar problems. This study focuses only on the EBC Amharic TV news to take audiovisual advantage which is aired on two prime times a day 1:00 o'clock am and 8:00 o'clock pm. And specifically, investigates the practices of covering Entrepreneurship issues in the Amharic newsroom. Every research can have some limitations essentially owing to time and resource constraints and lack of enough experience in research. Shortage of sufficient materials and relevant literature in the area was also a limiting factor especially in the case of Ethiopia. This research is limited to only TV medium specifically TV newsroom. Other mediums under the corporation and also In Ethiopia though there are other media institutions producing Entrepreneurship related stories in the country not included in this research. This thesis will contain five chapters. Chapter one presents the introduction, background of the study, statement of problem, research objectives, significance of the study, research questions, scope, limitation, operational definitions and organizational of the study. 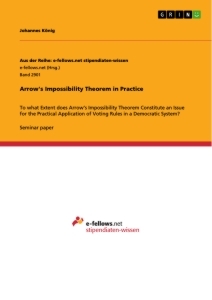 Also the second chapter discussion about the theoretical framework and the review of literature related to the study. Then the third chapter talks the design of the study i.e. the methodology such as; the data gathering techniques and other related things. Chapter four deal with data presentation, discussion and analysis. 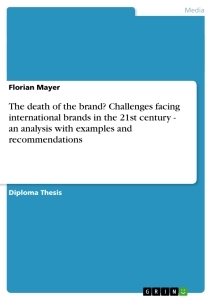 Finally the last chapter, chapter five, comprises the summary and conclusion of the study. The major findings are presented in this particular chapter. Suggested recommendations relying on the findings of the study are forwarded. In this study, Entrepreneurship is defined as any attempt at new business or new venture creation, such as self-employment, a new business organization or the expansion of an existing business by an individual, a team of individuals and an established business or start-up. In short, entrepreneurship is the phenomenon associated with entrepreneurial activity. Entrepreneur - is a person (business owner) who seeks to generate value, through the creation or expansion of economic activity, by identifying and exploiting new services, products, processes or markets. Or, a person who creative, innovative, add value, take a risk and opportunity is entrepreneur. Entrepreneurial activity - is the enterprising human action in pursuit of the generation of value, through the creation or expansion of economic activity, by identifying and exploiting new services, products, processes or markets. Entrepreneurship is one of the oldest activities. To discover or identify new business possibilities and to exploit these possibilities in new ventures for economic gain has always been important in human life. The main sources of wealth and development for human being are land, manpower, capital and entrepreneurship (Weretaw, 2005). The first three can be easily seen, measured and acknowledged. However, as quoted by Weretaw “Entrepreneurship is something that cannot be easily identified, measured and recognized.” There is no conventional consensus reached by scholars in defining the word entrepreneurship. In different studies different scholars, has defined it differently. However various scholars have written extensively on the origin of entrepreneurship. Originally, the concept entrepreneurship is derived from the French concept “entreprendre” which literarily is equivalent to the English concept “to undertake” or “doing some thing” which would later hold the meaning from the business perspective, which ‘to undertake’ simply would lead to mean ‘start a business’ (QuickMBA, 2001). Though all endeavors made, the definition of the term entrepreneurship have remained elusive. Entrepreneurship has a wide range of meanings. For example; according to Cassis and Pepelasis (2005), the meaning of entrepreneurship directly linked to self-employment. Entrepreneurship is self-employment of any sort; the activity that involves identifying opportunities within the economic system, the creation of new organizations, the willingness and ability of an individual to seek out investment opportunities in an environment and be able to establish and run an enterprise successfully based on the identifiable opportunities. According to Anders and Stevenson (2007), the term entrepreneurship as operating and developing businesses results from the imagination, vision, innovativeness and risk taking, creativity, drive and commitment of individuals, rather than as a result of government actions. On the contrary Coopey (2005), explain the term entrepreneurship is a system that includes entrepreneurs, institutions and government actions. Then the role of institutions and governments is to foster environments that will produce a continuous supply of new entrepreneurs. More often this term is seen as synonymous with a sharp sense of innovation and risk-taking . Being the main characteristics of entrepreneurship, innovation is defined as introducing new products, implementing new production techniques, finding new source of raw materials, and discovering new markets (Anita & Barbara, 1998). But entrepreneurs may not always be innovators; rather they have to be coordinators (Edmiston, 2008). The crucial essence of entrepreneurship is creation Lumpkin and Dess (2001). Building on the definition of entrepreneurship, they, explain that the essence of entrepreneurship is newness, new resources, new customers, new markets, and/or new combinations of existing resources, customers, or markets. Therefore, any activity that involves some or all of the above activities can be regarded as entrepreneurship. Entrepreneurship refers to all the processes and activities involving in establishing, nurturing, value adding and sustaining a business enterprise or can in short be referred as the process of starting a new venture. In developing countries the term is often used focusing primarily on small and medium sized enterprises (SMEs). In this case entrepreneurial activities include persons and firms found in the informal sector (Shivganesh, 2007). And also entrepreneurial firms in developing countries including “newly established”, “established but not growing”, “established but growing slowly”, “graduates of a medium and larger size” and, in somewhat recent phenomenon, “new and growth-oriented firms (Gutterman, 2015). The way entrepreneurship is practiced in emerging and developing countries is not as the way America and Europe. But the major functions of entrepreneur, which are to coordinate resource and increase economic output, are the same. Much of the attention in industrialized countries is accorded to entrepreneurial activity in high technology industries and to introduction of high-tech products. However entrepreneurs in the third world countries are involved in other economic sectors, such as service, trade, real estate, agriculture as well as small, medium and large manufacture (Anita & Barbara, 1998). Therefore, entrepreneurship is a multidimensional concept, the definition of which depends largely on the focus of researches undertaken on it. From the view of the definitions above, we can judge that the concept Entrepreneurship, laid emphasis on a wide spectrum of activities such as: risk taking, innovation, economic growth, utilizing opportunity it may be the support of government, SMEs, in self-effort (individual business), creation of organizations (a team of individuals business), combination of resources, identification and exploitation of opportunities with in the economic system or market and bringing together factors of production under uncertainty. Like entrepreneurship, the term entrepreneur has a wide range of difference in its meanings. The first writer to recognize the term entrepreneur is historian Richard Cantillion in 1755. According to Cantillion entrepreneur is directly linked to risk (Hebert & Link, 2009). And also they argue that “Entrepreneur is someone who engages in exchanges for profit. Specifically, he is someone who exercises business judgment in the face of uncertainty.” According to Casson and Godley (2005), entrepreneur is a specialist in taking on risk, ‘insuring’ workers by buying their output for resale before consumers have indicated how much they are willing to pay for it. Later on, an entrepreneur has got another definition that relates them to innovation by Joseph A. Schumpeter in 1934. According to Schumpeter cited in Casson and Godley (2005), entrepreneur is visualized as someone who creates new industries and thereby precipitates major structural changes in the economy. Despite the fact that Entrepreneurs innovate by carrying out new combinations; they are not only pure inventors, because they adopt the inventions make by others. On the other definition an entrepreneur is a person of very high aptitude who pioneers change, possessing characteristics found in only a very small fraction of the population. On the other extreme case of definition, an entrepreneur is anyone who wants to work for him or herself. In the perspectives of some people, they create a vision of some special, abstract qualities. On the other hand, the discussion on policies for ‘training and developing entrepreneurs,’ or for “increasing the supply of entrepreneurs” has tended to equate the entrepreneur with a highly “competent, successful, efficient manager or administrator” (Bhole, 2007). According to Achintya (2010), entrepreneur is should always be governed by three basic qualitative instincts to serve in the world of uncertainty. These are motivation, passion, and skill. The perspective on the characteristics to be possessed by entrepreneurs varies from scholars to scholars. However, being an independent, risk bearing, ability to find and explore opportunities, innovation and leadership are the most common characters tics of entrepreneurs that many scholars raised in their literatures (Dayal, 2007). These multidimensional characteristics are easily attracting the attention of media (Olayinka & Olaoluwa, 2016). So then, from various reflections that we come across previously it emerges that an entrepreneur fundamentally is envisaged to be virtuous of five main elements: such as identifying opportunity, taking the risk with action, sensitive to move up, creating values and self confidence. Thus, inculcating all the concepts we raised in mind, we can deduce that in the low and average income countries context like Ethiopia, it can strongly be sound to use a broad definition which would include the aforementioned elements of entrepreneur pairing with their status as ‘self-employed people’ generally. Self employed, creators of a new business organization as well as the expansion of an existing business by an individual or a team of individuals supported by a government or by self-effort, innovative, value worth, sensitive to move up, self confident to take a risk and opportunity are major defining concepts raised all across our way to call some one an entrepreneur. There are two types of entrepreneurs in the world. Both have one dimensional, but having different objectives. One type is commonly known, the profit maximizing type. The second is a new type of person, who is not interested in profit maximization. He/she is totally committed to make a difference to the world. He/she is social-objective driven. Based on this perspective, we can see that two broad categories of entrepreneurship, commercial and social entrepreneurship (Gutterman, 2015). However, different scholars categorize differently through different ways of thinking and based on the perceptions of their purpose. For example, in Ethiopian context the classification of entrepreneurs seems primarily bases on their common characteristics and levels. According to their ownership of the enterprises they can be classified in to two major groups; private and public. On the other hand based on their size they can be categorized small, medium and large enterprise. The current size based classification of entrepreneurs in Ethiopia makes its criteria on human capital and asset. The minimum asset requirement for services and industry sectors also vary (Berihu, Abebaw, & Biruk, 2014). What ever they are commercial, social, private or public, small scale, medium or large entrepreneurs have there own non replicable role in the social and economic development of a country. Since the end of 1970s, there has been a growing awareness of the importance of entrepreneurship and roles of the entrepreneurs to the growth of the economy. This holds true both in developed and developing economies of the world (Achintya & Baruah, 2010). Some scholars argue that, both the theory and evidence suggest that entrepreneurial activities play a pivotal role in economic growth, entrepreneurs being the crucial determinants. It is precisely because of this that governments are so keen to encourage entrepreneurship (Pathak & Singh, 2007). Entrepreneurship helps to reduce unemployment problems of the country (Rao & Prasad, 2007). In developing countries where there is shortage of capital, managerial resource, and skilled labor force, the promotion of entrepreneurship and small scale enterprises could be an important approach to economic approach by absorbing labor force (Endris, 2008). Based on the literatures above, the roles that entrepreneurship plays in economic development include: Generates employment, increases productivity through innovation, facilitates the transfer/adaptation of technology, ensures increased resource utilization, stimulates growth in those sectors which supplies it with inputs, re-invigorates large-scale enterprises, encourages and sustains economic dynamism that enables as economy to adjust successfully in a rapidly changing global economy. Therefore, entrepreneurship enables individual to use their potentials and energies to create wealth, independence and status for themselves in society and increases private sector participation in the manufacturing sector. And also the developed economies of the world are an evidence of the role entrepreneurship plays in economic development. Therefore, entrepreneurship has become a “burning issue” and one of the bigger communication topic elsewhere; media, society, politicians, or almost everybody, looks forward to it throughout the world. After it has set its position in a given society and economy, the relation between entrepreneurship and mass communication has also significantly grown in recent times. Journalists and governments for the support of creation and development of new venture stories are springing up everywhere in the world, to meet an ever growing demand. Communication can be a "complement" to positive change under certain conditions. Dependency theorists of different schools have reintroduced the notion of communication as a powerful external force generally hindering positive social change (Howard & Frederick, 1993). There was a debate in the 1970s about the notion of communication's role in development. The major change from the former paradigms, especially Lerner's in The Passing of Traditional Society, is the serious questioning of whether mass communications are an independent variable and a significant positive motor for change in development (McAnany, 1984). According to Mc Anany (1984), the debate of the last decade of 19th century has made it clear that communication is complex, and, moreover, it cannot, without danger of bias, be removed from its social context. The conclusion from that debate, it can be argued that, mass communication in a given country should gear itself toward the promotion of national development goals and not simply follow the style of a western commercial press. So communication is needed for sustainable development of a country. So then, Communication for Development (C4D) becomes popular in developing countries. C4D is a people-centered way of communicating development, which promotes and elaborates on people’s development needs, perspectives and aims. It is communication about the full range of social, cultural, [economic] and political themes within people’s experience of development and it is targeted at a wide range of audiences, including the dominant communicator nodes - namely government and policy makers, the mainstream media, private sector, and institutional civil society to affect change (Communication for Development Concept, 2004). Development efforts in recent years have started to focus on other equally important factors such as human capacity and access to relevant information , knowledge and services. Documented experiences and lessons from the field have in fact indicated that development tends to fail for two basic reasons which are derived from mass media, lack of participation and ineffective communication (Acunzo, Pafumi, Torres, & Tirol, 2014). Therefore C4D is just a matter of getting the message right or mounting public awareness campaigns, a social marketing effort persuading to adopt new behaviors rather a one-way flow, top-down transfer of information. C4D rests on the premise that successful sustainable development calls for the conscious and active participation of the intended beneficiaries at every stage of the development process; development cannot take place without changes in attitudes and behavior among all the people concerned. Participation involves the more equitable sharing of both political and economic power. Media and way of approaches in participatory communication are among other things: interactive TV news and programs, community radio and newspapers. The main theme is empowering people to make their own decisions and show how people will galvanize themselves into action to address their priority problems (Servaes, 2008). In the C4D aspect the main communication is directed at information delivery to the people with the aim of economic empowerment and deepening citizen participation and rights. The role of local content in this aspect is growing, with more awareness that e-governance, welfare and economic information can be ably supplemented by locally produced content that is empowering (Communication for Development Concept, 2004). Therefore giving media coverage for entrepreneurship issue should be one of the focusing areas of media content. However the major problem in using this communication loop is it has traditionally weak feedback by people to the dominant communicator nodes, primarily to the NGO and private sector nodes, with very limited communication routes to media and government (ibid). Thus communication for development also requires a “looking and listening society” whereby the communication will be received and considered, not simply ignored and further isolated. To be effective C4D also needs to be preferable, credible and trustworthy. Among the wide range of communication channels, the most commonly used in urban and rural development is Mass media, those with national coverage, managed and staffed by media professionals. Particularly, television has its own advantages such as; wide coverage, it combines sight, sound and motion, thus more attention grabbing, and high prestige. Communication on entrepreneurship transforms the power generated by governments, policy makers and private investors into action. Since scholars and policy makers recognize the relationship between positive communication and its impact on the economic development, countries throughout the world starts to inform, educate and promote its people by using mass media (James, et al., 2008). According toOECD (2010), perceptions of the entrepreneurship are to a large extent determined by cultural contexts, individual efforts, visions, lifestyles and value judgments which are acquired through mass communication. In the more than twenty years span between 1991 and 2014, the number of economically active youth or the youth labor force around the world has declined by 29.9 million while the overall youth population grew by 185 million; and it in turn resulting youth labor force participation rate declined by a significant 11.6 percentage points over the period. A principal factor behind the sharp decline in youth participation rates is the tendency for more young men and women to engage in small business is less because of lack of information, knowledge and entrepreneurial skills (ILO, 2015). For example in Ethiopia, according to Ministry of Finance and Economy Cooperation, the population of the country has reached one hundred million and of which half of it is young and workforce generation. However, 16.8 % of the population is unemployed (MoFED, 2015). According to UN Habitat (2003), cited in (Nayak, 2014) in Ethiopia, most people are motivated to start their own businesses and create their own employment because the chances of finding jobs in the current labor market are so limited. However, being equipped with the necessary attitude and skills is important, not only to get employed in a well paying job but also for starting one’s own business. The lack of entrepreneurial motivation especially from the media, lack of vision/ innovation and inability to produce good business plans or feasibility studies are all part of the problem youth are facing in starting their own businesses. This indicates that communication on entrepreneurship or promoting entrepreneurship through mass media would mean awakening unemployed youths to become self employed and to indicate, inform and educate their existing opportunities. Therefore to reap and widen the multidimensional role of mass communication on entrepreneurship, many countries and their media around the world, pay special attention to entrepreneurs. According to the reviewed literatures the most target groups by media to promote entrepreneurship are: (a) innovative start-ups, (b) women and youth entrepreneurs, (c) immigrant entrepreneurs, (d) high growth or growth oriented entrepreneurs. Particularly in Africa youth and women, start ups and growth oriented entrepreneurs are the main target of the media. Media formats such as newspapers, TV and radio are important mediums to transmit cultural values and ideas. They can also help to structure people’s perception of entrepreneurship so as to foster an entrepreneurship spirit through society (Hang & Weezel, 2005). Media can explain the importance of entrepreneurship phenomenon, by creating a discourse that transmits values and images ascribed to entrepreneurship, by providing a carrier promoting entrepreneurial practices, and by encouraging an entrepreneurial spirit in the society. On the other hand Entrepreneurship also has its own role in media industry. The essential characteristics of the entrepreneurial activities such as creation, innovation and novel ways of thinking are critical in building media business success (Duraipandian & Devasenathipathi, 2009). There is strong relationship between media and entrepreneurship. According to Duraipandian and Devasenathipathi (2009), the positive media coverage of entrepreneurs delivered the media may promote the development of entrepreneurship in the society. But in contrast, the neglect of entrepreneurial phenomenon by mass media may hinder the proliferation of entrepreneurial activities. Based on this strong relationship during the period 1971-2004, the interest in media and entrepreneurship is increasing around the world, particularly during recent years. However, research on communication between entrepreneurs and media and their impact on business activities, as well as on general social development is difficult to conduct because it is a very dynamic economic category that expediently and clearly reflects all changes in business conditions and market disorders (Ivić, 2012). Ivic noted that, the research on media influence on entrepreneurial activities as well as on general social development is not a task easily accomplished because the economic category is very dynamic, in that it very clearly and swiftly reflects all changes in terms and conditions of business and of crisis communication disorder. Therefore, a general examination of Devasenathipathi and Duraipandian’s research shows that, there are eight researches which are focused on media and entrepreneurship between in the 1970s and 1980s. The field improved significantly in the 1990s, with the emergence of 25 studies. During the recent years 2000 to 2004 much more research has been done and 43 works are identified as relevant to entrepreneurship and media. However 87% of the researches focus on how much entrepreneurship influence the media industry and 13% of the researches about the influence of media on entrepreneurship (Duraipandian & Devasenathipathi, 2009). However, the study of media’s role on entrepreneurship can be very helpful to encouraging the entrepreneurial spirit. Thus, the literatures indicate that less attention is given to media and entrepreneurship research, particularly the role of media in entrepreneurship. In Africa and more specifically in Ethiopia also research on media and entrepreneurship is worse. Thus, this research will contribute its part on the area. The media, whether public or private, plays an important role in any economy by gathering support or opposition for those who govern, by highlighting the views and ideas, by providing a voice for the people and by simply spreading economic information for entrepreneurs. The media are more likely to promote better entrepreneurial activities when they are more likely to satisfy three conditions: the media are independent, provide good quality of information and have a broad reach (Islam, 2002). On the other hand, the role of media is not only transmitting information regarding entrepreneurship or SMEs business and modern farm technologies in urban cities but also to promote entrepreneurship in rural areas for overall industrial and agricultural development (Singh, 2003). So developing entrepreneurial qualities among rural masses by beginning their inner potential is an important task in which media can play a vital role. Through proper messages, the entrepreneurial qualities like creativity, innovativeness and moderate risk taking can be inculcated. Media can deliver their message in a direct and vivid way what an entrepreneur could be like. Apart from presenting entrepreneurship, especially TV can also provide factual information in an interesting and even entertaining way. The media could present the role models that are necessary to attract more citizens, and especially the young, to become entrepreneurs (EC, 2007). According to a research conducted by European commission, several activities, measures and policies could be tried to better promote entrepreneurship via TV and other audiovisual media. For example: - Competition of entrepreneur’s idea, awards for the promotion of entrepreneurship, Better cooperation between governments, administrations, producers and broadcasters etc is encouraged, Video clips and a platform to promote entrepreneurship could be produced and distributed for free to TV stations and an exchange of good practice cases between cities or states (ibid). Including Ethiopia, entrepreneurs in Africa encounter many obstacles, in terms of survival and development in these unstable market territory and time. Media have therefore a demanding task of maintaining dignity, avoiding sensationalism and actively participating in entrepreneurship development (Ivić, 2012). As a result, positive media coverage complements policy initiatives designed to provide enterprise skills and support start ups. Actual start ups require both aspiration and the capacity to act. In this sense, positive media portrayals of enterprise may well be contributing to the effectiveness of these more concrete initiatives (GEM, 2010). Mass media is the primary means of communication used to reach the vast majority of the general public (Olayinka & Olaoluwa, 2016). According to GEM (2010), Mass media could influence individuals to consider entrepreneurship as a viable career option, either for themselves or for individuals they know. Therefore, based on the above literature we can conclude that media could also prompt entrepreneurs to take action, such as gathering resources, becoming alert to opportunities or developing relevant skills. The strengthening perspective could maintain and reinforce a desire to continue along the entrepreneurial process, perhaps by lowering fear of failure or highlighting the rewards of successful entrepreneurship. But this is not means that, the media do not give coverage the negative stories. The point is if the media failed to promote entrepreneurs they may have failed by not performing this vital function actively enough. If entrepreneurship has a priority role in economic development, the coverage and influence of media on entrepreneurial activities is crucial, especially in creating a more favorable entrepreneurial climate. So; many national governments use mass media, as a tool, to promote entrepreneurship, (Anders & Stevenson, 2007). Accordingly, societies with a high level of media coverage on successful entrepreneurs might be expected to experience a higher level of entrepreneurial activity in all stages of the entrepreneurial process (Kevin & Kim, 2006). On the other hand, entrepreneurs in countries that have greater amounts of positive media coverage of entrepreneurs indirectly create an environment, which is more conducive to new venture creation by encouraging public acceptance of entrepreneurship (Mccormick, 2013). Therefore, the multidimensional character of entrepreneurship is reflected in the great variety of types of programs that deal with the issue in one way or another. Some researches identified the following types of program; news report, documentaries, educational programs, movies and series (EC, 2007). However, news reports on have a big advantage over most other types of program because news can be produced in a fast and flexible way, and can thus react to emerging economic and political developments or events that have an influence an entrepreneurship. Media in different countries have different programs which are focus on entrepreneurial activities. For example in Czech Republic a public media has a TV program called “POKR”, the program presents brief stories about entrepreneurs and their businesses, it gives advice and informs about new developments important for business. In UK there is “The Hustlers” this program is addressed to a young audience. It shows young people who run their own business and describes their problems, successes and failures. In Poland “Firma”, the program shows how to start a particular type of business, how much money needs to be invested, which regulations have to be observed, which investment and equipment is necessary. In Spain “Dreamers”, in this planned one-hour program a real entrepreneur will play the role of the anchorman who presents the story of three businessmen. In Denmark “jump”, in each of the first eight programs the television followed two young entrepreneurs and reported about their start-up, their problems and successes (EC, 2007). Thus, what the amazing thing is all programs lasted from 20 minute to 90 minute. It is very large coverage from television airtime perspective. And the programs run at prime time of the media including weekend days. This means the programs have a large number of target audiences. Media coverage of entrepreneurship in America was reached high level before the last three decades. According to Wall Street Journal (1985), cited in (Montagno, Kuratko, & Scarcella, 1986) the energy of entrepreneurship has gone through cycles in American business and currently is experiencing a growth period with greater media coverage than ever before. So, it is widely accepted in the American business community that entrepreneurial ability is the key to improved productivity and to more effective competition in the world marketplace. And entrepreneurship is increasingly being integrated in media institutions. The more visibility a local entrepreneurial ecosystem has through story-telling and media coverage (Pettit & Pitingolo, 2016). By using many types of television and other audio visual media, countries especially the western countries can increase there coverage. According to Ali, Lu, Cheng, and Chaoge (2012), media coverage of entrepreneurs to promote entrepreneurship is high and most evident in United Kingdom, United States, and Canada and to some extent eastern European country Finland. In UK enterprises and the concept entrepreneurship receives regular media coverage, so public awareness of its importance is rising (Enterprise and entrepreneurship education guidance for UK higher education providers, 2012). However, it should be considered there are significant differences in media coverage of entrepreneurship between the UK regions. For example, in Northern Ireland the media coverage of entrepreneurship focusing on stimulating and supporting the development of start-ups has played it own role. For this reason 59% of adults in Northern Ireland consider that there is good media coverage of entrepreneurship in the region (GEM, 2004). Most of the time in America, UK and Canada the media coverage of entrepreneurship issue is highly integrated to innovative and large entrepreneurs whereas in Europe there is supportive finding for the proposition that media coverage is significantly associated with opportunity search activity and start-up activity; these are the first two stages in the entrepreneurial process. In general, the practice and level of media coverage on entrepreneurship issue in developed countries is different from region to region and of course country to country. And it depends on the countries entrepreneurial activities, awareness on the role of media in entrepreneurship development. Like the western countries, media coverage of entrepreneurship issues in developing country is different from region to region and country to country. For example, Entrepreneurs are respected within Philippine society. Philippine media coverage on entrepreneurship is one of the highest in the region and highest among all Asian countries. Filipinos are not afraid to start a business with 39.2% indicating fear of failure, lower than the average for the region. It also registered the highest percentage of the population (44.1%) that considers entrepreneurship as a good career choice (GEM, 2014). However, according to Pinto (2007), the levels of entrepreneurship in the republic of Macedonia and Mexico are low. Countries are not generating sufficient start-ups partly due to lack of awareness of entrepreneurship, focus on employment rather than self-employment, as well as the underdeveloped market orientation of the economy. The current perceptions of general society are consistently negative in relation to entrepreneurship. Therefore, a lot of media coverage is needed, which counteracts this negative perception by presenting role models or portraits of success (Bala, Echeverry, Morales, J., & Schonhardt, 2009). Similarly in Cuba, According to Peters (2012), the coverage of entrepreneurs was thin and mainly fell into three categories: stories about pilferage of state resources to supply private businesses, stories about food service establishments that violate health codes, and stories about entrepreneurs profiting from deeply subsidized public services such as electricity. However, since late 2011, there is much more coverage of entrepreneurs and much of it is positive especially the state media are covering the sector sufficiently and, in a new weave, favorably. Based on the adult population survey in Chile which is conducted by GEM in developing countries, new businesses have lots of media coverage for example in 2013, 98% of Chilean citizen believe that new or start up businesses are given media attention. It was 75% during 2008 (Mandakovic, Cohen, & Amorós, 2015). On the other region in Middle East, before 2010 it is not surprising that local media print, TV and even social media does little to promote entrepreneurship. Still, the dearth of media coverage on entrepreneurship is incomparable with other side of the world. Yet, media coverage that does occur can reverberate, hinting at a strong, nascent entrepreneurial spirit in the region (WEF, 2011). However, the afghan TV program can be a model in a region. It was globally distributed. It was an immediate success and became the number one TV hit of the season in Afghanistan. Millions viewers learned each week about micro finance, developing a business plan and voted for their favorite innovative idea. The show introduced thousands of participants to resources and new ideas about social business. This will show how well used media can effectively and positively impact the promotion of an entrepreneurial culture in a country (EMN, 2012). Similarly according to Bennell, (2000) cited in (Chigunta, Schnurr, Wilson, & Torres, 2005) during the early years of independence in the 1960s and 1970s, especially young and women in Africa did not pose a serious social problem. As a consequence, unemployed and “disadvantaged” youth and women were not seen as a major target for governments and media. Since the mid-1990s, however, concerns have been rising over the socioeconomic situation of young people in much of African countries and the prospects of creating additional livelihood opportunities for them. So, if the fundamental Africa's problems is high youth (15-35 years old) unemployment, and unable to integrate more youths into the business sector to alleviating the numerous of issues associated with unemployment, underemployment and poverty, media coverage of entrepreneurship is needed more than ever (Anita & Barbara, 1998). Policymakers in Africa have long recognized the private sector, including entrepreneurship, to be a key part of development agenda for the countries and the continent (Nkurunziza, 2012). However, this recognition has its own limitations, including the role of media to promote entrepreneurship development especially in low income and fragile countries (Brixiova & Ncube, 2013). But right now in the 21th century the context is highly changed. According to Herrington and Donna (2012), survey, on average, over three fourths of the people of Sub Sahara Africa (SSA) countries believe that entrepreneurship is a good career choice (ON, 2012). Thus, based on the literatures most of African countries, without exception, entrepreneurship seen as a good career choice. Therefore, media professionals and scholars see effective media coverage of entrepreneurship as an essential part of creating self employed, innovator, risk taker, developed society and responsive governance. In this view, vibrant media coverage especially in Africa is intimately linked with society’s development, which could include the need to tackle poverty. According to Angela and Jon (2007), Strong, media coverage could help create a more favorable environment for entrepreneurship development and its wider efforts to tackle poverty, with the following potential roles; a) Communicating with and informing a wide range of audiences on enabling opportunities to become entrepreneur. b) Providing an open forum to reflect and bring in different public views particularly about the practice and challenges of entrepreneurs. c) Providing an inclusive platform for public debate. d) Scrutinizing and holding governments, executive bodies, politicians, businesses and CEOs to account for their actions on the development of entrepreneurship. The empirical researches show that from Africa as a country Nigeria and Ghana has better media coverage on entrepreneurship. The research of Amodu, et al, which is focus on the print media of Nigeria, it was thus discovered that from the four newspapers analyzed 78% of stories are deal with the issue. It is evident that the issue of entrepreneurship was covered. More so, most of the published stories were on Nigerian entrepreneurs rather than foreign. Therefore, according to the researchers the media indeed play a vital role in exposing entrepreneurial activities in Nigeria (Amodu, Ekanem, Yartey, Afolabi, & Oresanya, 2016). In Ghana, entrepreneurship is given more coverage which extends to 80% which is exciding Nigeria 78%. But the coverage is seen as biased. According to Koltai, Mallet, and Muspratt (2013), some people are over celebrated while other great stories never get told. Frequently, coverage of business tended to focus primarily on non-specific macroeconomic topics, such as Bank of Ghana announcements. When entrepreneurs are covered, it was usually the same high profile individuals’ over and over again extremely successful business leaders. On the other hand it is explained by Koltai, Mallet, and Muspratt (2013), approximately three out of every four individuals interviewed by the researchers were critical of the performance of Ghanaian media in covering stories of entrepreneurship, they generally believed the media failed to sensitize, inspire, and educate the broader Ghanaian society about the power and value of entrepreneurship, and they felt the media often did not understand how to tell the stories of up-and-coming entrepreneurs in a positive manner (Koltai, Mallet, & Muspratt, 2013). However, the critic is derived from there high demand of independent and fair distribution of media coverage. Because, the percentage of the coverage is high when compare to other African countries. Even in our neighbor Kenya according to Kelly, Bosma and Amoros (2011) cited in (Kabui & Maalu, 2012), through a survey they can point out indicators of attitudes towards entrepreneurship. These indicators include the extent to which people think there are opportunities for starting business, their perceived capability of doing so, their fear of failure and the level of risk one is willing to take. They note that these attitudes are largely shaped by societal perceptions such as through media coverage of entrepreneurship. In general, not only media and communication but also marketing scholars argue that media coverage of entrepreneurship is more likely influential than advertising especially in Africa context. For most small and new businesses (news coverage, product reviews, etc.) has a significantly greater impact on sales than an equivalent amount of advertising. Customers are less likely to ignore and more likely to believe media content compared to advertising (Reilly, 1997). In general , media coverage of entrepreneurship in Asia, Middle East and particularly in Africa, it seems to be low compared to the capitalist countries like UK, Canada and USA. But some countries like Nigeria, Ghana, Botswana, Kenya and South Africa are better than others. Even when it may have been raising the coverage in quantity, often lacks analytical depth and human focus (Angela & Jon, 2007). There are historic and systemic reasons mentioned as a reason why African media so weak on covering the entrepreneurship. Koltai, et al (2013), find out the following; a young and politically oriented press, low overall journalistic capacity, the practice of tipping (brown envelop) journalists have developed a practice of expecting a “tip” for coming to an event or covering a story. Before the review of the coverage of entrepreneurship in Ethiopia looking to what entrepreneurship is look like in the country is important. Because, the history of media and entrepreneurship reflected by the nature of political economy of a country. Ethiopia has a long history of entrepreneurship that began when the Aksumite kingdom was a trading hub more than 3000 years ago. During Aksum civilization traditional Ethiopian traders, model farmers, and tool makers were an entrepreneurs (Jeffrey, 2014). According to Tegegn (2002), after the battle of Adwa, Ethiopian emperors start to look out side the country to share international experience and they are tried to follow open door foreign policy. These international relations increase from time to time. Hence, emperor Menelik II changes his perception and understands the profitability of modern trade or the role of entrepreneurship. He was aimed to create the modern Ethiopia. The first entrepreneurs in Ethiopia next to artisans are Menelik II and Ethiopian empress and the wife of emperor, Etege Taytu. Ethio-Djibouti Railway enterprise in 1881 (it was share business with French company) and Mill business are started by emperor Menelik II. And hotel service investment was started by Etege Taytu during in 1898. Taytu hotel is the first hotel in Ethiopia and still working in the capital city of Ethiopia Addis Ababa paisa. Then judges, peerages and the family of capitol inter in to local and international business. Since the period of Menelik II (1989-1913) many Ethiopians change their traditional perceptions and follow the modern trade system including bank, industry and import export business through stock and cooperation(Tegegn, 2002). Emperor Menelik was the first Ethiopia’s leader who supports entrepreneurship by giving recognition and preparing written regulation for entrepreneurs. The regulation was demystified in January 17/1900 E.C to protect the entrepreneurs by saying “any one who assault the worker force because of his/her work is be careful” (ibid). Here the researcher tried to put the translation of the regulation directly from Amharic version. This was the first written form regulation of Ethiopia about entrepreneurship and it is a basement for the new entrepreneurship history of Ethiopia. However, until the period of Minelik II, there is no one modern mass media communication found in Ethiopia. The first Ethiopian newspaper came to birth around late 1890s. Even if the history of early media began before Menelik II came to power. However, as far as the history of modern media is concerned, it is associated to the era of Minelik II. According to Alemayehu (2003), cited in (Nigussie, 2014), the first newspaper was started being published in 1890s with the coming of a four page weekly newspaper named “Aemero”, which means “intelligence”. On the other finding the first volumes of Aemero had a circulation of only 24 handwritten copies, but the circulation rose to about 200 when it began to be duplicated on a new printing machine in Addis Ababa in 1905 or 1906 (Skjerdal, 2012). This indicates that what ever the number of copies, the media is referred only print media and it was marked by a degree of government control (Skjerdal, 2012). The media was used only for satisfying the wishes and whims of the emperor. It was only used for disseminating government agenda rather than promoting development issues like entrepreneurship (Seifu, 2008). The media coverage of issues through broadcast media is began from emperor Hailesilase I. But also, in Ethiopia the media has been highly shaped by the governments which ruled over different periods. The media was mainly meant to serve the wishes and whims of those on power; it served the respective ideological spheres. So there is also different media and entrepreneurship history during the Imperial, Derg and EPRDF regimes. The Imperial Regime (1930-1974): - According to Endris (2008), the feudal culture has affected the development of entrepreneurial derive. It despises enterprising people and activities. Those who engage on enterprising activity were the landless. Even if the Imperial regime pursued a market-based economic policy, entrepreneurs are not free and competitive on the free market because of the political system. This implies that enterprising people were not encouraged or get media coverage unless they were from high class society. Even if, broadcast media came to Ethiopia during Hailesilase regime, radio in 1935 and the first television signal in May 1963 on the important occasion of the first meeting of the Organization of African Unity. Ethiopian Television (ETV) began permanent broadcasting on 2 November 1964, coinciding with the 33th coronation of Hailesilassie. The program schedule had a combination of news, live drama, story reading for children, dancing and cultural documentaries which are represented the manner and wealth of the higher class (Skjerdal, 2012). On the whole, “the feudal mindset affected both media structures and [media content]" (Skjerdal, 2012). The media in the imperial regime really grew at that time, but most of the products of the former ETV the presence EBC were they had a delimited content which focused mostly on the royal family and the king and expressed simply the whims and wishes of the king rather promoting entrepreneurship (Seifu, 2008). Therefore, this shows that media coverage of entrepreneurship in imperial regime was impossible unless entrepreneurs should be from the upper class society. Because media is the only tool for emperor and upper class, in contrast majority of entrepreneurs were from lower class. The Derg Regime (1974-1991):- During the time Ethiopian entrepreneurs don’t have a right to exceed half a million birr (approximately not more than 22,000 $ by the current exchange rate) because of socialism ideology. And the asset of many entrepreneurs was nationalized (Nigussie, 2014). During this regime media was used mainly for propaganda. Yosef (2005, pp. 38-39), cited in (Nigussie, 2014) argue that during the early days of the student revolution (1974), even if it could not last long, the press was used as a platform for relatively open discussion. However, in short period of time, the regime changed the landscape of the Ethiopian press for good, and started to use the media primarily for propaganda purposes and for the spread of socialist ideology. Moreover, in its nationalization program, Derg nationalized privately owned large scale enterprises and entrepreneurs. In the words of some journalism professionals the Derg’s media became ‘the worst piece of Marxist mouthpiece on the Continent’ (Skjerdal, 2012). For that reason, the years of the Derg regime have unequivocally been portrayed as a dark chapter in the history of Ethiopian media and entrepreneurship. It can be said there is no media coverage of entrepreneurship in the country, because, the regime turned all media outlets into propaganda channels and effectively forbade any opening for professional independence. The newsroom environment was marked by fear and anxiety. EPRDF Regime (1991 to date):- This period begins by adopted the typical structural adjustment policies of market liberalization, with the support of the W.B and IMF (Alemayehu, 2006). The first decade of the EPRDF regime (1991-99) was marked by a series of with the aim of reversing the command economic system by the way of fostering competition, opening the economy and promoting the private sector and of course entrepreneurship (Gebreeyesus, 2013). The government makes three reforms which are a light of the bright feature for media and entrepreneurs as well as to press freedom and entrepreneurship notion. Therefore, the new history of media and entrepreneurship began in the regime of EPRDF. The media situation during EPRDF is significantly different from that of the three previous regimes, especially with regard to formal media policy and openings for independent journalism. Several succeeding law reforms were made with specific relevance for the media. One of the very first bills to be issued by the new government was a proclamation defining the functions of the state media. The proclamation assigns an important role to the state media, demanding unbiased news and exposure of government shortcomings (Skjerdal, 2012). Therefore, during this regime if entrepreneurs count as the engine of economic growth they should have balanced and appropriate media coverage. The media industry is growing at large during this regime. Countless private press come and goes because of different factors, there are more than 12 FM stations based on Addis Ababa, more than 50 community radio stations throughout the country. Most of regions have there own TV stations except Diredawa, Harari, Afar, Benishangul and Gambela regions. And there is still one state TV with three channels including the focus of this study EBC1, EBC2 and EBC3. This is a good progress at least in the entertainment, but lags much behind. This is the government’s effort, however, can be in a weak position by low level of professional competence, degree of readiness to diversify programs and the capacity to compete with foreign media (Nigussie, 2014). Some scholars criticize the media by saying “ the state-owned media became simply the propaganda machinery of the new (EPRDF) government, launching violent verbal attacks on those political or ethnic groups that are ill favored by the ruling circle” (Bezabih, 2000). And the media is not impartial and critical to cover government activities (Nigussie, 2014). However, these researches conducted before four and five years back and it’s from media and politics perspective. Therefore, to examine the media coverage of socioeconomic development issues like entrepreneurship, it needs to look things from media and its own coverage of development issues perspective. It is important to discuses on the extent too which the government has committed to the development of entrepreneurship and to create favorable conditions for entrepreneurs. Because, this will help to questioning the media, if the government is committed that much, too what extent the state media is giving coverage for the issue. From the beginning when EPRDF come to power the government adopted the structural adjustment of policies. According to Gebreeyesus (2013), the three phase reforms include the following points. The first phase of the structural and economic reform programs took place during 1992/93-1994/95. Measures undertaken during this period include among others: a) Liberalization of the foreign exchange market starting with a massive devaluation of the birr by about 150 per cent in October 1992, to discourage import and encourage export of the country; b) Rationalization of public expenditure; c) Introduction of a new investment code, labor and public enterprise laws; d) Removal of subsidies and export tax rebate; e) Liberalization of prices except for petroleum; f) Reduction of the maximum import tariff from 230 per cent to 80 per cent; and g)Liberalization of payments for invisible transactions, and easing of market entry for privately-owned banks and insurance companies. The second phase of the economic reform programs (1994/95-1996/97) aimed at limiting the role of the state in the economic activities and promotion of greater private capital participation. The third phase of the reform program spanning the period 1996/97-1998/99. 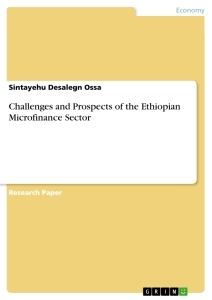 Under this understanding, the government committed itself to achieve broad-based economic growth with a stable macro-economic environment, while the liberalization measures were further strengthened (Gebreeyesus, 2013). In accordance with Article 55 sub article (1) of the Constitution of the Federal Democratic Republic of Ethiopia, the investment proclamation to support domestic and foreign entrepreneurs is proclaimed as follows: Investment Proclamation No.769/2012. The investment proclamation Article 11 sub article (1) states that, any foreign investor, to be allowed to invest pursuant to this proclamation, shall be required to allocate a minimum capital of US $ 200,000 for a single investment project. Were as domestic entrepreneurs not restricted as they can involve into business. And it is specifically explained on the regulation investment incentives and investment areas reserved for domestic investors’ council of ministers regulation No. 270/2012. The regulation article (3) sub article (1) states that, the following areas of investment are exclusively reserved for Ethiopian national’s entrepreneurs to encourage them; a) Banking, insurance and micro-credit and saving services, b) Packaging, forwarding and shipping agency services, c) Broadcasting services, d) Mass media services, e) Attorney and legal consultancy services, f) Preparation of indigenous traditional works, g) Advertisement, promotion and transition works, h) Air transport services using aircraft with a seating capacity up to 50 passengers. In addition to these categories domestic entrepreneurs could involve all allowed to foreign entrepreneurs and also they are beneficiary from all available incentives including income tax exemptions, additional income tax exemptions, exemption of capital good and construction materials from custom duty, and exemption of motor vehicle from custom duties. As many low income economies, entrepreneurs and SMEs in Ethiopia face economic barriers that prevent them from operating at full capacity. Recognizing these barriers, the government of Ethiopia through federal SMEDA and related agencies has been exerting a concerted effort to support the entrepreneurs through various policy packages (Girum, et.al. 2015). The Micro and Small Enterprises sector is also described as the national home of entrepreneurship. It provides the ideal environment enabling entrepreneurs to exercise their talents to the full and to attain their goals. In all the successful economies, entrepreneurs and MSEs are seen as an essential springboard for growth, job creation and social progress at large. Depend on this Positive measures are generally being undertaken by the government to promote entrepreneurship, stimulate economic growth and reduce poverty in the country (Micro and Small Entreprises Development Strategy, 1997). The thesis is the pioneer for other African media scholars and Media practitioners. What should be media play to promote private sector as a whole and specifically to entrepreneurship development? What are challenges to give a coverage? And what likes the practice in Africa particularly in Ethiopian state media? And other issues are fully addressed.